Runyan became the first player from a Burlington County school to win the contest on Feb. 18 when she defeated Bishop Eustace’s Katie Kempter in the finals. 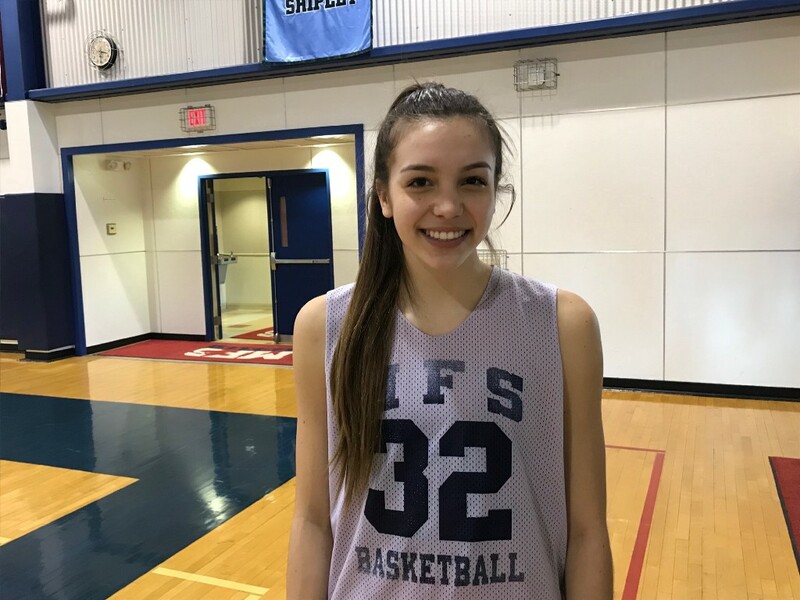 When Moorestown Friends School sophomore Bella Runyan entered the 2018 South Jersey Invitational Basketball Tournament’s three-point contest, she didn’t have high expectations. Runyan admitted she has struggled with her three-point shot through much of the season. Runyan’s focus paid off, as she outlasted more than 100 competitors, winning the contest on Feb. 18. A Moorestown resident and the daughter of former Philadelphia Eagle offensive lineman Jon Runyan, Bella is the first player from a Burlington County school to win the three-point contest in its nine-year history. The three-point contest is run in conjunction with the annual South Jersey Invitational Basketball Tournament. Girls basketball players from all South Jersey high schools are invited to compete, with more than 100 players typically entering the contest each year. In the contest, participants shoot three racks of six balls each. Two of the racks are set up on each wing and the third rack is at the top of the three-point arch. Each basket is worth one point. A money ball is included in each rack and is worth two points. Shooters also get a chance to take one shot from half court worth five points. Moorestown Friends had three players entered in this year’s tournament — Bella, her sister Alyssa Runyan and senior Charlotte Stern. All of the entrants participated in a preliminary round during the weekend of Feb. 10. Runyan had participated in the contest in 2017, but failed to advance out of the preliminary round after scoring 11 points. This year, Runyan improved slightly, scoring 13 points. Her score was good enough for sixth place, making her one of the eight players to advance to the next round. Runyan tried not to think too much about the contest heading into the quarterfinals on Feb. 16. She didn’t even decide to practice for the contest. In the quarterfinal round on Feb. 16, Runyan had her best showing of the contest. She put up the highest score out of the final eight competitors, scoring 19 points. Her total included making the five-point half-court shot. “I made a couple this season in practice and my sister made one in a game just two days before,” Runyan said about the half-court shot. Runyan entered the semifinals on Feb. 18 with a lot of determination, especially after Moorestown Friends lost a SJIBT showcase game against Haddonfield Memorial High School the day before. On Feb. 18, Runyan finished in the top two in the semifinals, scoring 16 points. She advanced to the final, which took place at halftime of the SJIBT championship game between Cherokee High School and Shawnee High School. Runyan faced off against Bishop Eustace Preparatory School freshman Katie Kempter. Kempter and Runyan are friends and used to play on the same club team together, the Philadelphia Belles. Runyan, who shot second in the finals, was nervous going into the last round. She didn’t focus on how many points she needed or how many she actually scored in the finals. She just concentrated on getting each basket in. Runyan took advantage of some of Kempter’s misses toward the end of her round and showcased some consistency in winning the contest, 13–10. Runyan believes the contest taught her how to focus better and it will help her improve her perimeter shooting in games. Runyan hopes her improved three-point shot will help Moorestown Friends down the stretch. The Foxes entered their Feb. 22 game against Haddon Township High School with a 15–5 record and are seeded №8 in the Non-Public South Group B tournament.